Alas, some four years after this teaser, the film seems no nearer to completion. 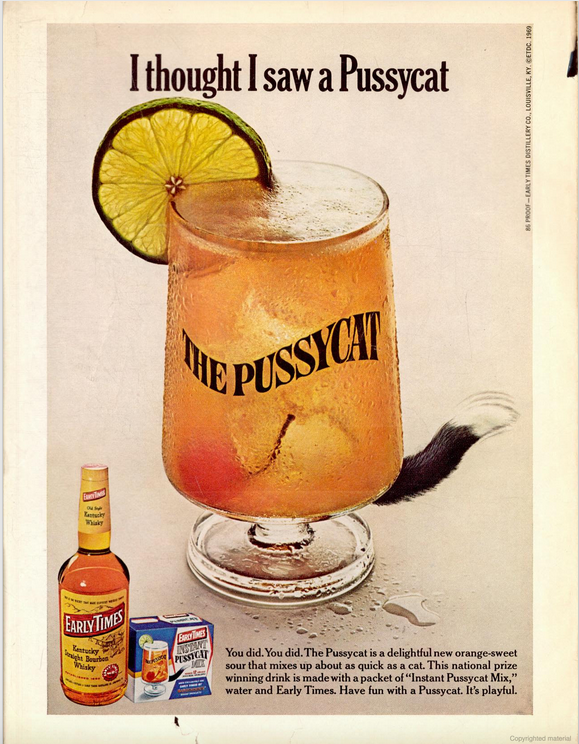 Maybe cats thought it tasted great, but it sounded disgusting. Missing Cat Poster or Art? 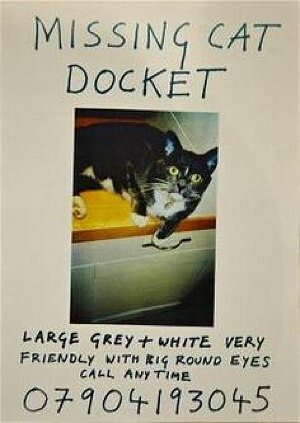 In 2002, artist Tracey Emin's cat, Docket, went missing. So she put up 'missing cat' posters around her neighborhood. But since she was a famous artist, people immediately began taking the posters down and selling them. Reportedly, they fetched prices as high as £500 each. This prompted a spokeswoman from Emin's gallery to issue a statement: "Tracey does deal with memorabilia, but the posters are not works of art, it's simply a notice of her missing cat to alert neighbours." The Missing Cat posters are problematic because the moment they reach a public they are coopted by the poncif already set up by the artist, and as such they become arranged "as part of [her] oeuvre". They are readily coopted because Emin’s particular trademark is "near-absolute identification of the artist with her work": work that is characterized by confessional and subjective autobiographical content that the posters also supply. We might say that Emin has created a convincing, life-sized tableau of her life, and it is difficult to exclude from this tableau anything she does or produces. Incidentally, Docket was eventually found. The Crazy Cat Lady is the cultural stereotype (Archie McPhee even sells a Crazy Cat Lady action figure). But this story demonstrates that there are definitely Crazy Cat Men as well. 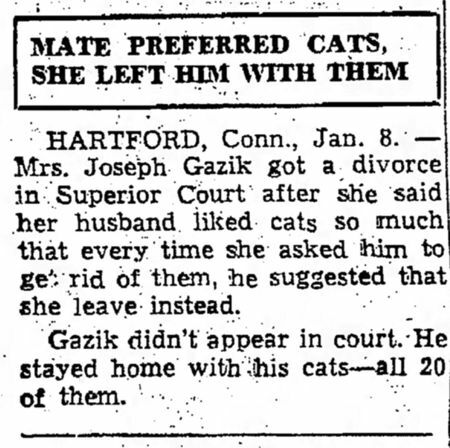 HARTFORD, Conn., Jan. 8 — Mrs. Joseph Gazik got a divorce in Superior Court after she said her husband liked cats so much that every time she asked him to get rid of them, he suggested that she leave instead. Gazik didn't appear in court. He stayed home with his cats — all 20 of them. This was not a model of car that had nine lives. 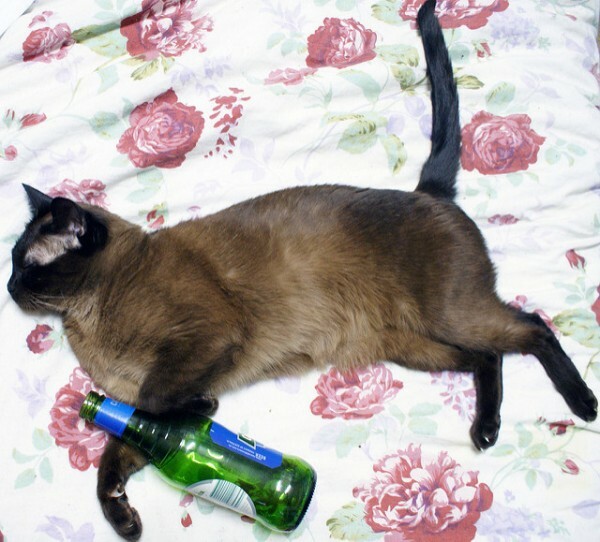 Now you can turn your cat into a wino and never drink alone again with kitty wine! 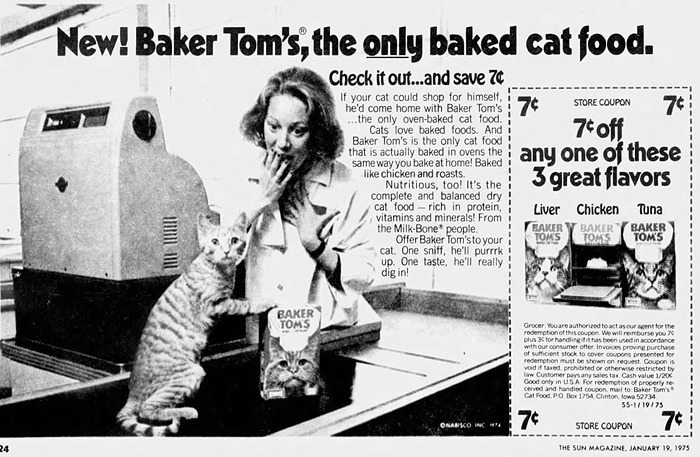 The ingredients do not include actual alcohol, just catnip, water and beet juice. But considering the company is based in Colorado who knows what kind of weed is in there. The inventors of the Licki Brush say, "We have designed LICKI brush to bring you and your cat closer. By using LICKI with your cat on a regular basis, you'll develop a more intimate and bonded relationship, much like a mama cat bonds with her young." As of May 22, on Kickstarter they're one-third of the way to successfully funding the manufacture of this thing. Most cats, if allowed out, will bring home birds, rodents, and other critters that they've caught. 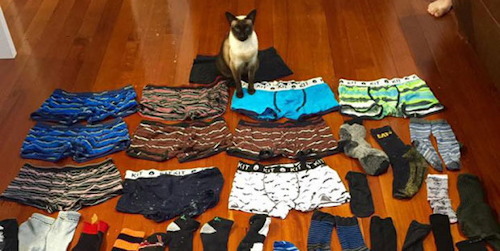 But Brigit, a 6-year-old tonkinese who lives in Hamilton, New Zealand, has been bringing home underwear and socks. Lots of them. Says her owner, "It's all men's. It's really, really weird. She's got really specific taste." Brigit's owner has distributed flyers on the street in an attempt to reunite the underwear with the person it belongs to. But so far no one has claimed it. Another animal artist, to complement Alex's canine.